Simon Denny, Secret Power, 2015. 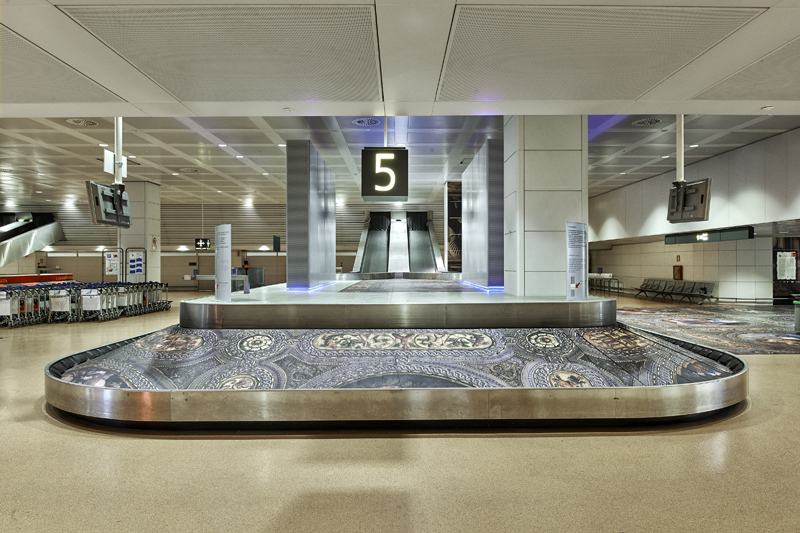 Installation view, Marco Polo Airport arrivals lounge. Photo: Paolo Monello. Something has to take the concept of the avant-garde forward. […] How can you address the contemporary without addressing the digital? Every time I read those words I’m taken back to that moment of breathless optimism. For me it marks the height of our techno-utopian recent past. I recall thinking that one day I would look back on this platform ephemera and be separated from those ideas by some historical break. This was the time when Google was to save the world, Facebook was to connect us all, and the solutionists from any number of Silicon Valley insurgents might remake our society — first on the “free” web, then on their heavily-engineered proprietary platforms. Yet these quotes spoke to something more. Unchecked optimism about the role of technology had crossed over and joined up with the art market’s insatiable drive for the new. The museum and the gallery would be torn down, just like Blockbuster and Encyclopedia Britannica. Only this time this triumphant advance wasn’t from the likes of Duchamp and Broodthaers but Zuckerberg and Thiel. Within a few years the community we might collectively call “Museum Tech” was pounding the war drum, entertaining all manner of techno-determinist futures to rescue a museum-centered mission marginalized by the internet. A new cadre of platform capitalists saw the institutional form as so much dead wood. Their argument was convincing. The platform would serve us where institutions couldn’t or wouldn’t. Update now or suffer the fate of academic irrelevance, or worse, technological obsolescence. We hadn’t quite shaken the modernist penchant for radical progress when it was hijacked by the rallying cry of innovation and disruption. This new way of organizing the world elevated the individual above the institution. It was liberating. But at what cost? Who would interrogate the ways in which the ideology of Silicon Valley had encroached on the humanist endeavor of the cultural institution? We’ve only just begun to process a historical shift whereby an old form, the institution, has begun to be intermingled, and often replaced, by a somewhat new arrangement: the platform. This action has necessarily caused an equal reaction: organizations that started out as digital platforms are now performing central services and consuming resources once reserved for institutions. My mail still arrives by US post, but the service is hemorrhaging funds as I check my email compulsively. My commute takes place over crumbling infrastructure, while riders shift to ridesharing apps powered by 1099 contractors, leaving labor protections weaker. Telecommunications firms and some tech giants, such as Google, see to it that I have “public” Wi-Fi while venture capital investments lure the greatest minds from our teaching universities to lead teams that remake the built environment. A small team at Facebook knows more about what happens to the American electorate than most groups inside DC. With this, we’ve come to recognize a new hybrid entity: the platforms that appeared on the historical stage as light and flexible have come to be entrenched, weighed down by the responsibilities once assigned to institutions. These were just some of the issues at the root of a strange experiment known as “Cloud-Based Institutional Critique,” a small group of artists, writers, and technologists that began to meet for discussions in New York in 2014. I still find it difficult to categorize — in practice we assembled in various physical spaces, but the conversation extended online, where we cohered into a sort of community. The intention was to correct discursive gaps within an institutional climate overrun with techno-utopianism. We had been trained to critique institutions, but what about platforms? The vocabulary of critique would have to be rebuilt to adjust to new targets. This issue, which will unfurl over the next few months, assembles some of those voices. It moves in different directions. Our subject is the hybrid institutional form, that heavy machinery infused with the weight of the institution and the agility of the platform. There are few final answers; but the problem we’ve sketched is getting harder to ignore. The term “platform” has always described some type of mediation. Today the term connotes a mediation over digital networks. The platform began its ascent just as a few key material conditions appeared. With the low cost of transmission and storage of information, as well as the mass marketization of the consumer internet, the promise of networked communication made the platform an organizational mode worthy of emulation. Benjamin Bratton defines platforms as highly technical forms that do not plan themselves, but allow plans to be realized upon them. In theory, they are designed to be light, flexible, and temporary. The opposite is true of the institution, which, though various in its appearance, is predicated on permanence, structure, and consistency. Massive corporate actors like Facebook, Apple, Google, and Amazon feel like institutions — economically, they are larger than many nations. But despite their prominence, they are just larger accumulations of many platforms operating according to the organizing principles of computer networks. These digital networks are asynchronous, establishing a “many-to-many” presence unlike any institution before. The asynchronous platform is, formally, modular and decentralized — any one part can be swapped out with little changed to the larger whole. But an institution will arrive with a fixed set of ideas imprinted upon its structure. Institutions change, but when the pieces move a wake is left. The platformization of society is not only part of our larger envy of the new immersive world of digital technology. It also deeply political. A platform is something you erect when you don’t have the full support of an institution; it often starts out as a low-risk endeavor incubated in the gaps of the institution. When institutions are called into question, critiqued, or otherwise cast aside, the platform is happy to step in. For public transportation, there is Uber; for accommodations, there is Airbnb; for medical insurance, there is GoFundMe. While platforms mimic the functions of institutions, they haven’t the means nor the desire to replace them. Their aim is destruction. The word “institution” has always been hard to define, too. It’s stayed true to its Latin root, which is to say it has remained promiscuous. Instit- means to give action, to instruct, or to fix. An institution, then, signifies something about form, but also implies a set of beliefs, often closely held, sometimes merely tolerated. When you say something feels “institutional,” we just know what you mean. But much more than semantics is at stake. In this plastic hour we can compare the institutional form that we knew with the institutionalized platform that now mediates so much of our daily lives. It is an opportunity, even, to think of “the institution” in the past tense, to find the essence of an organizational form now thrown into sharp relief. We might start with the thesis that the institution is concerned with the quality of its production, the platform with the efficiency of its transmission. The power of the platform is in the administration of a network — in its ability to deliver things optimally and according to profit maximization, and without concern for the social impact of this delivery. And yet the platform works with an ideology far more potent that the most hegemonic of our institutions: indifference. It doesn’t mind what you do or say so long as you use its pipes. This is why Twitter won’t ban Nazis. This is how a few marketing wunderkinds were able to make Facebook into a tool of polarization. They were just performing one of many millenarian solutions built for and by short-term investors, for and by circulation in infrastructural networks, for and by temporary sources of revenue. Institutions can be defined by their ability to preserve something. Whether it be an abstract belief or public goods, such as a set of laws or books, the institution is either literally or symbolically a reliable means of storage. But the specific format in which an institution stores its contents is secondary to the agreement that such content is valuable. A book is not useful because it is in a library; a library is useful because it stores books. Platforms, on the other hand, collapse the distinction between the demand for a thing and the means of transferring and organizing that thing. Instagram is not committed to photography as much as it is interested in the idea that we consume media in a new way, on a smartphone that is also a camera. Put another way, platforms collect objects in a way that is primarily linked to the tools used to store and display those objects. Thus the means of storage are elevated above the importance of the content. This platform logic is, ironically, how we get the concept of “content” in the first place. Content is anything that is demoted below the transmission layer, disconnected from its a priori worth, subjugated. The technology is the governor. An institution, meanwhile, can exist as an idea, and may be resurrected by mere suggestion that it could have a public once again. In this sense, institutions may serve a public, but they do not require one. And because they do not require a public for their ideas to hold forth, and because they only serve a public in the broadest, most disinterested sense, institutions insulate themselves from pure market logic. There are museums without visitors, empty cathedrals, cold archives. The platform, however, requires an active public to function, a public which it must force into perpetual motion in order to generate capital. In this way, institutions express a type of fixity. They require commitment and maintenance. But the platform can be broken down, disassembled, sold for parts. And it is only ever where its users are, which is to say, nowhere and everywhere at once. As their critics correctly point out, institutions exert control over their subjects by declaring and enforcing authority. A platform may not directly impose authority, yet it exerts control in more furtive ways. When an institution is knowingly imposing a viewpoint, it can be traced, subverted, refuted, and sometimes made anew. But for the platform, authority is gained only through infrastructural monopoly — Google doesn’t have the answers the way in 2018 the Catholic Church had the answers in 1418, but Google (or Amazon, Facebook, or Apple) will happily control the journey to the answer. These platforms can’t be proven wrong — they’re how you do the proof. In “What Was Institutional Critique?” Blake Stimson defines institutionality as any “identification with a set of rules that governed social interaction.” But tactically, the artistic practice that originated with the anti-authoritarian climate of the 1960s and the 1970s took as its subjects the museum, the collector, and the gallery. As “children of ’68,” these artists confronted those institutions as powerful framing devices compromised by the contradictions of market capitalism. Institutional critique ran aground when it began to not only fail to deliver on the utopian promises it had made, but more insidiously, was subsumed into the institutional infrastructure that it set out to critique. Like Facebook users calling out algorithmic oppression on Facebook, the artists needed the institution to levy their critique, never fully evading our collective agreement to tolerate the charade of high culture for the sake of a few good one-liners. It is for these and other reasons that in 2018 the invocation of “institutional critique” is met with jaded groans. Institutional critique failed, but now it’s in an even worse predicament: our institutions seem to be defined by a preoccupation with critiquing themselves at precisely the time when they are no longer the true threat, no longer a worthy object of critique. The power to which those critiques were addressed has shifted, all but vacating the institutional form in favor of the platform’s more agile operations. Yet the legacy of Institutional Critique remains trained on the models of resistance for structures in their death throes. To add to the confusion, the rhetoric around critiquing institutions today (the university, the museum, and the state) originates from far beyond the walls of the institutions themselves. Institutional critique had always maintained something of a self-serving, self-reflexive character. But today platform evangelists who share few of the institutions’ underlying commitments have co-opted the message of institutional critique. These new charismatic crusaders don’t want to restore the institution to some mythical ideal; they aim to replace it with lighter digital frameworks. Now we are preoccupied with new questions. What will happen when the institution becomes indistinguishable from its platform extensions? Do the platforms that mediate cultural production share the values of the institutions that they are replacing? When will the transformation from culture to content break us? Each of the provocations that institutional critique made to its old subjects can be made to our new platforms. Our invitation, then, is to form another program out of the discursive clay of the tradition of critique: one that can interrogate the techno-determinist narratives that have hijacked the institutional imagination; one that radically confronts the tools deployed by platform capitalism. It is true that by some measures the art institution finds itself at a low point — its influence over daily life and its ability to frame the human experience has never been more vulnerable. But in this spell the institution may reimagine itself as a place where we bear witness to the effects of a world reframed. The institution might just be the perfect organizational form by which to resist the platform, one type of heavy machinery to confront another, two modes of organizing production, and perhaps our last answer to the notion that all value lies in transmission.